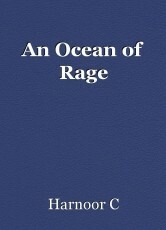 I feel like I am swimming... Or more like drowning... Drowning in an ocean of rage. Hands appear out of nowhere to help me, but as I start to near the surface, they disappear... Like all the other people who gave up on me too soon and left me alone to struggle with this anger that consumes me. Sometimes I am motivated to swim as hard as I can to reach the surface... At other times, I am numb... Not moving... Sinking and watching the world darken around me as the light moves further away and I am swallowed by the ocean. © Copyright 2019 Harnoor C. All rights reserved.